Sorry... the 2017 Honda Accord Hybrid is no longer being sold as new. Instead, take the first step to a great deal on 2019 Honda Accord Hybrid with a free price quote! Honda took the wraps off of the latest entry of its electrified vehicle initiative, the 2017 Honda Accord Hybrid. The sedan marks the return of a hybrid to Honda's midsize sedan lineup after the last version was discontinued following the 2015 model year. The new Hybrid features an all-new drivetrain; the more compact, lighter system boosts fuel economy. Three trims are available: the base model, EX-L, and Touring. 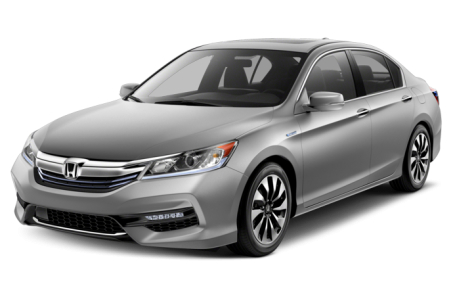 The new Accord Hybrid is visually nearly identical to the updated 2016 Accord that made its debut last year. Changes include some discreet hybrid badges, blue-accented headlights and taillights, and unique wheels. Even the grille carries over to the Hybrid model. Unless you look closely, you'll likely mistake the Hybrid for a conventional Accord. Inside it's the same story. The Hybrid has the nicely appointed, well-laid-out cabin that has made the Accord a favorite among midsize shoppers. Three trim levels are available: Hybrid, Hybrid EX-L and Hybrid Touring, each corresponding to additional content. Apple CarPlay and Android Auto are available with the optional Display Audio multimedia system, and a more compact lithium-ion battery pack has improved trunk space from 12.7 cubic feet on the 2015 Hybrid model to a class-leading 13.5 cubic feet. That's big enough for a couple big suitcases, and only 2.3 cubic feet less than the standard Accord's trunk. All of the big changes come from the all-new powertrain, which starts with Honda's two-motor hybrid system mated to a 2.0-liter four-cylinder gasoline engine. It makes a total of 212 horsepower, and does not use a conventional transmission. Instead, drivers have the choice of three modes. EV Drive mode draws power from the lithium-ion battery pack, allowing the car to be driven on electric power alone for limited distances under light load. Hybrid Drive mode uses the main electric motor to propel the vehicle, while the gas engine runs a second motor/generator to replace power drawn from the battery. Last, Engine Drive mode uses a locking clutch to combine the power output of the gas engine with the output of the main electric motor to drive the front wheels. It all results in a slight boost to fuel economy. Honda estimates the new Hybrid will get a best-in-class rating of 49/47/48 mpg city/highway/combined, a slight increase from the 2015 Accord Hybrid. The 2017 Ford Fusion Hybrid is EPA rated at 43/41/42 mpg; other hybrid sedan competitors have not yet announced model-year 2017 fuel-economy ratings. The new Hybrid model will receive the Honda Sensing suite of electronic safety features as standard equipment. The package includes a wide-angle backup camera, remote engine start, lane keep assist, adaptive cruise control, automatic emergency braking, lane departure warning, forward collision warning and road departure mitigation. The new Accord Hybrid is expected to arrive in showrooms this spring. 37 of 38 (97%) consumers said they would recommend this vehicle to a friend.